Nature has always inspired man and his creations. He has embellished them by things he has seen around him. Flora like flowers,trees,foliage,fruits,lotuses,creepers,honeysuckles and fauna like elephants,horses,camels,bulls,birds like swans,parrots have all been depicted in scenes and decoration on religious shrines, temples and other monuments across India, over centuries. Sculpture depictions on religious monuments using flora and fauna was as per the relevance of the subject and artistic convention of the time and region. In Buddhist art the bodhi tree, the jambu tree ,the sala and the asoka tree are very significant as they are part of Lord Buddha’s life. He was born in a sala grove under an asoka tree, mostly meditated under jambu trees and attained enlightenment under a bodhi tree. Trees, flowers et al. were used decoratively to enhance the sculptural composition for a more splendid effect. Palm trees, kalpavrikhshas, some fruit trees like sita-phal (custard apple), coconut,mango and banana have all been used as motifs. 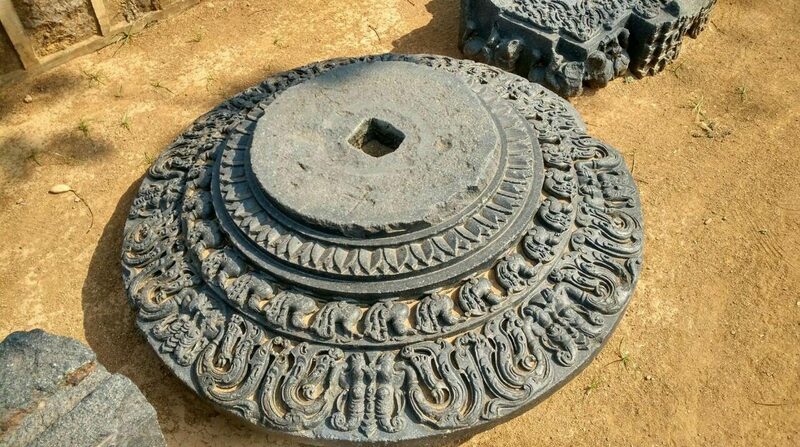 Kalpavriksha (wish-fulfilling divine tree)with rectangular fruits is found at Aihole and another one at Ellora datable to 10th century. Floral depictions use the roundel frequently in sculptural art which has a common motif . The roundel could have another decorative motif within. A naga is depicted inside the roundel on ceiling sculpture of 8th century Alampur temples in Telangana in South India. Lotus is the national flower of India and is the most popular motif. It is associated with poornaghata or pot of plenty. Plenty includes health, wealth and a long life. Lotus represents abundance, purity and fullness of life. Sculptors used various motifs from nature to decorate pillars,ceilings,borders,facades and pilasters.The creeper,honeysuckle,scrolls have all been used as motifs. The terracotta temples at Bengal have also used the floral motif to heighten the impact and decoration of the plaques and sculptures. Floral medallions and designs surround many creations and themes. Floral borders depict the mastery of the craftsman, as one can see from the examples below which serve as illustrations. Islamic influence on the designs can be felt at some places. The depictions below are of a twin temple at Baidyapur, Bardhaman district of West Bengal. Probably built around 1550 by Shubhananda Pal, the temple is a classic example of rekha deul architecture The temples are connected by a corridor. This type of temple is called a jora-deul. The floral motifs are prominent and striking; sculpted centuries ago ! Twin temples, Baidyapur, Bardhaman,West Bengal. Floral motifs at twin temples at Baidyapur, Bardhaman, West Bengal. Vegetal designs at twin temples at Baidyapur, Bardhaman, West Bengal. The Lalji temple has 25 spires and is a Panchavimshati-Ratna. It was built by Braja Kishori Devi, the wife of Maharaja Jagat Ram in 1739. Built of bricks, and the walls are covered with terracotta figures. The panels depict ornate floral designs. One can also see the seamless motifs in vegetal patterns. The Shyamrai temple is a pancharatna temple built in 1643 by Raja Raghunath Singha. The temple has an ocatgonal central shikhara and the remaining four are square in shape. Lord Krishna’s life is depicted on the ornate carvings. Each side of the temple has three arches. The seamless designs and the floral patterns are awe-inspiring to the onlooker. 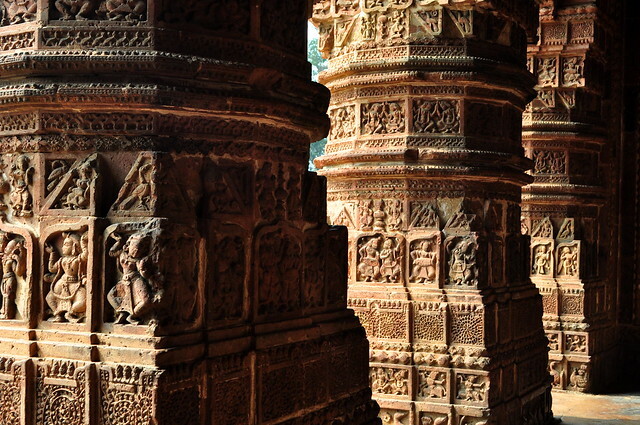 Motifs at Shyamrai Temple, Bishnupur, Bankura,West Bengal. Motifs on pillar, Shyamrai Temple Bishnupur, Bankura,West Bengal. Floral medallions, below arches at Jor Bangla temple, Bishnupur,Bankura, West Bengal. Terracotta Lotus Medallion, Palpara Temple,Nadia,West Bengal. This entry was posted in art history of India, Bengal art, Flora, sculpture of india, Uncategorized and tagged art history of Bengal, Bengal, Flora, sculpture, Temples on October 17, 2017 by historyreads. A horse is an animal who represents energy and movement, known to man for ages. The horse is a companion and a useful animal for various purposes and has been used extensively to drive chariots, carts and as the Cavalry Force along with its rider in battles of yore. Swift and reliable, the horse is revered and there have been many famous horses known to have even saved their riders life. Such is their loyalty. In Bankura district of West Bengal the horse is depicted as an art object with some ornamentation. This Bankura horse has become an iconic symbol of Bengal art . The Government of India uses it in its logo for All india Handicrafts. Such is the magic of the horse depiction. It is found at many homes across India and abroadin drawing rooms and gardens. The presence of the Bankura horse immediately livens the space. Made of terracotta or burnt clay, the horse is either mud-brown or black in colour. Elephants are also made by the craftsmen or karigar, but the horse has got more prominence and popularity. The Bankura horse is produced mostly in the Panchmura village of Bankura district. The other places where the kumbhakars or potters make this horse along with other depictions like the elephant are Rajagram,Sonamukhi and Hamirpur. Also at Biboda,Kamaridha,Bishnupur,Jaikrishnapur,Nakaijuri and Keyaboti. The popularity of the icon has led to its being made in metal and wood. Horse, animal known for its swiftness and energy, graphic depiction, 21st century. The history of the Bankura horse is interesting. It was initially used at village rituals as a symbolic sacrifice. This is done to appease village Gods and Goddesses for fulfillment of wishes. The horses stand tall and erect with lively long ears. They wear the Chandmala on the forehead. The horses made for worship are usually not hollow but solid. Dharmathakur who is also believed to be a form of Hindu God Surya rides on a seven-horse chariot. Lord Surya, painting by Raja Ravi Varma, 19th century. The brick and terracotta temples of Bengal built during the 17th and 18th century depict animals, birds and humans along with floral and geometric patterns as part of the temples as plaques or medallions and also as narratives on the walls of the temples, of the epics, the Puranas, Radha-Krishna and everyday scenes reflect the expertise of the artists and the refined taste of the patrons. The horses are made by the use of a tool called the ucha, a semi circular piece of bamboo. Balya is a stone tool, used for beating, also pitna, a wooden beater. Bamboo Chiari is used for decorating the figures.The potters wheel and kiln are also used. The parts of the horse or elephant are made separately on the wheel and later joined to from the horse. The ears and tails are made in moulds and fixed on the body on grooves. The figures are kept to dry a bit in the sun, then kept inside to dry fully and again heated outside and then the figures are coloured with natural colours. The pigments are mixed with water and applied. The colours are fixed in the kiln. Bankura horses and elephants,terracotta,21st century. Kantha embroidery on quilt with a horse depiction, 19th century. This entry was posted in art history of India, Bankura, Uncategorized and tagged animals, art history of Bengal, Bankura, Bengal, nature, sculpture, Terracotta on October 17, 2017 by historyreads.